OK guys, this one is a little complicated. Not the recipe, not the ingredients, but pronouncing the focal point of the “dish” (if you will) – Gjetost. I just scoured Youtube to find a video demonstrating how one says the name of this little nugget of delicious, and came up with NOTHING! (On YOUTUBE?!) I know what you’re thinking: why would I assume that I, Jewess of Westchester county, know the correct pronunciation of this Norwegian delicacy and all these blonde-haired, blue eyed, tall people on Youtube got it wrong? Well, Chris spent a few months in Norway several years back so I’m trusting him for the real deal here. 1. What IS Gjetost? It’s a carmelized Norwegian goat cheese. Sweet, salty, smooth, delicious. 2. 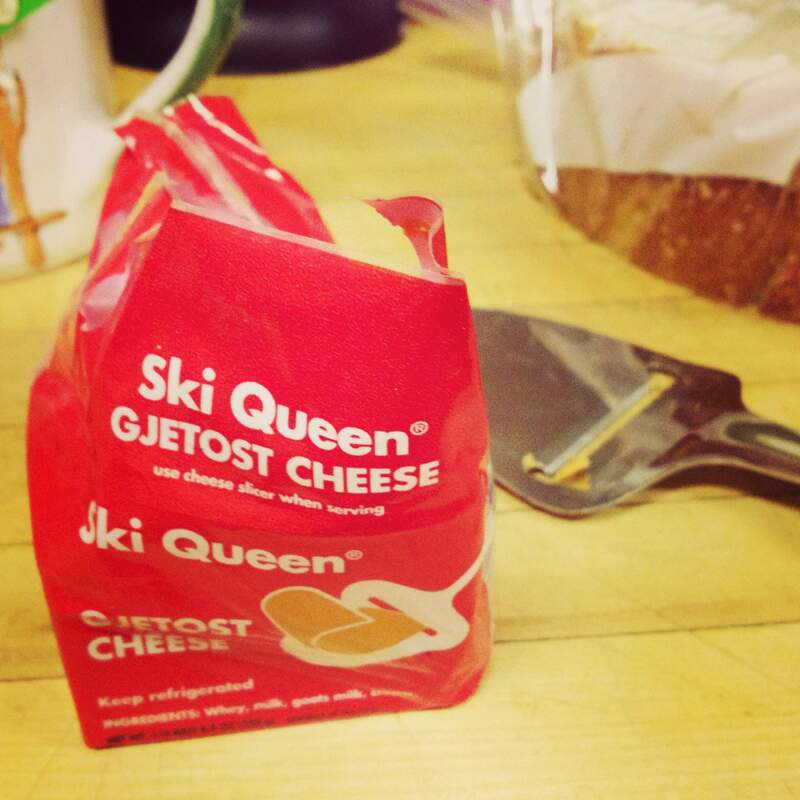 Where does one purchase Gjetost? Previously from Amazon only in the US, as far as I could tell. But I recently discovered that they sell it at Whole Foods, which is why it now feels appropriate to put this on the blog. 3. What was that I heard about a reenactment of the Hanukkah miracle in a Norway tunnel a few weeks back? 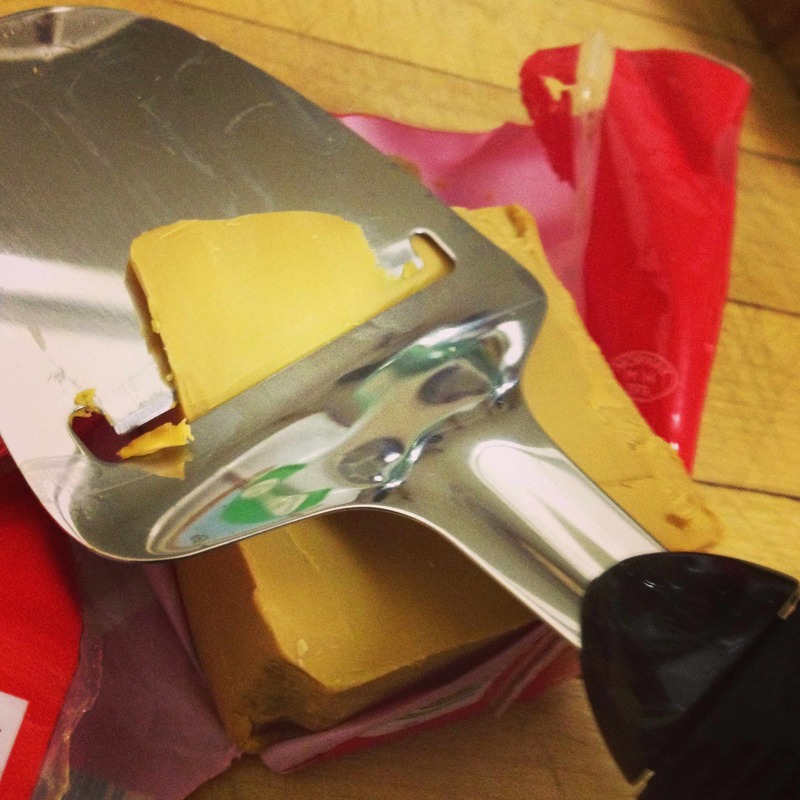 http://www.guardian.co.uk/world/2013/jan/22/norway-cheese-fire-closes-tunnel A truckload of brunost, a kind of gjetost (or is gjetost a kind of brunost?? Hmm… I don’t know) burned for five whole days. Whoa. That must be some smooth cheese. To soft boil eggs, put them in a pot with enough water (starting cold) to cover them. Boil for 10-13 minutes on high heat. Exact time will depend on your burner and how hot it gets – might take a couple of tries to get the exact right timing for runny-in-the-middle but hard-boiled whites. Slice the cheese very thin as per the photo. Place cheese on top of the warm toast. It will melt a bit. Yum! Cut the eggs in half and put them on top, letting the yolk run. Well, the first thing I must acknowledge is my unfortunate absence from our lovely blog. A weekend in LA in celebration of a certain contributor was a great reminder (not that I needed one) of all the super awesome ladies in my life and how much I love staying connected! I must admit I was a little intimidated by the aioli at first, but Chris made it look super easy and the NYT subsequently published an article about it: http://www.nytimes.com/2012/05/23/dining/easy-homemade-mayonnaise.html?_r=1&scp=1&sq=aioli&st=nyt. Apparently the trick is a bit of water. For the crab: When you buy it ask the fish monger to clean to crabs. Mix the flour together with the paprika, salt and pepper on a plate. Heat the butter until its melted in a skillet. 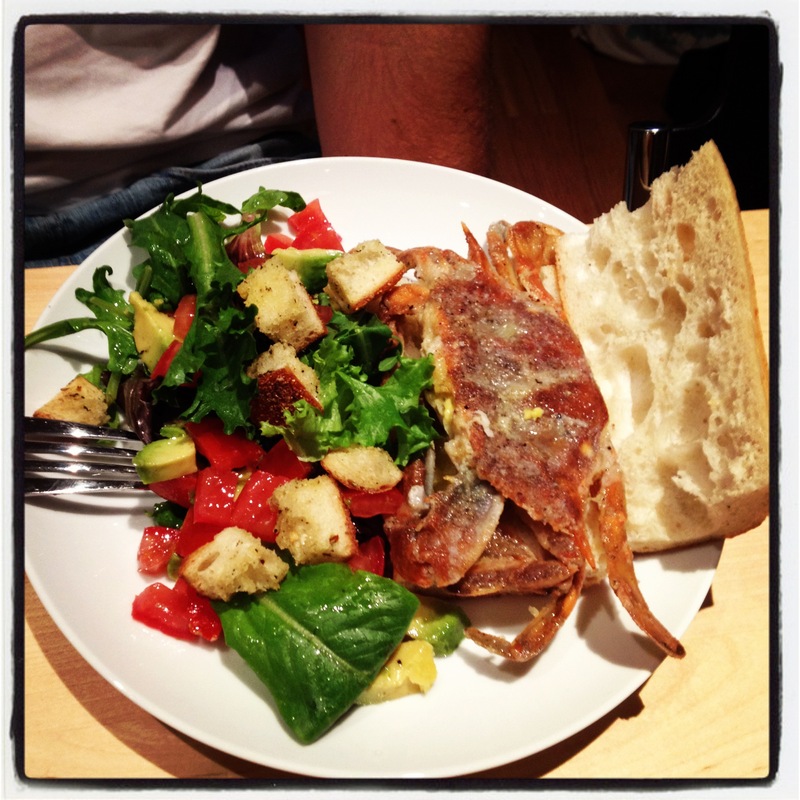 Coat the crab all over with the flour mixture – you can just put it right in, no egg or anything else necessary. 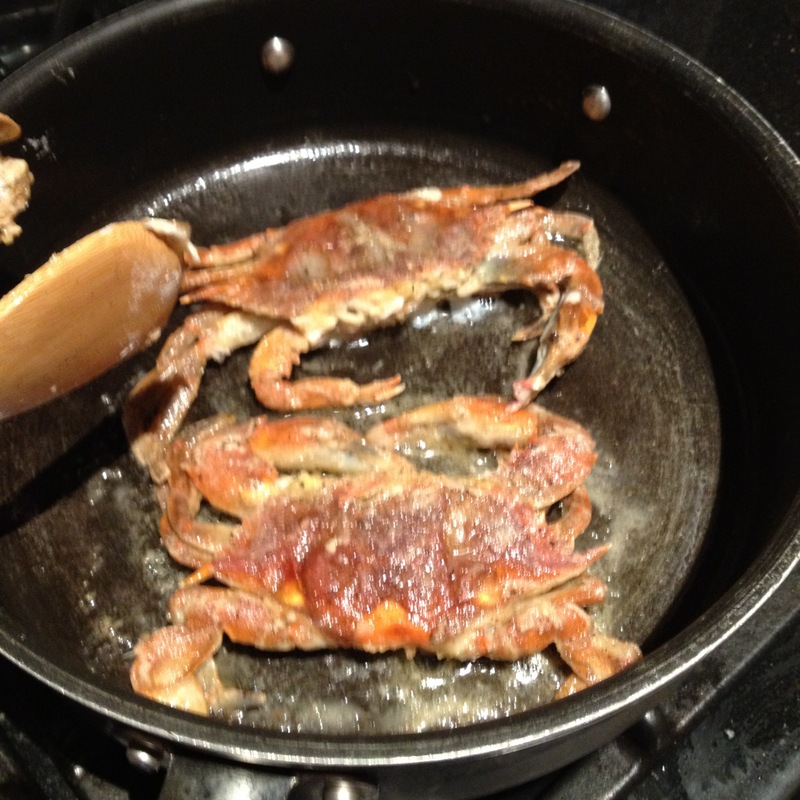 Fry the crabs on both sides for ~2.5 minutes. For the aioli: Pound the garlic with a pinch of salt using a mortar and pestle. Whisk the egg yolk with a 1/2 tsp water in a bowl. Dribble the oil in, a little at a time, whisking constantly. The mix will become thick, opaque and lighter in color. Be careful not to over-whisk as it can collapse. For eatin’: Toast the baguette, smear with aioli, throw on the crab, sprinkle with lime, and go to town. 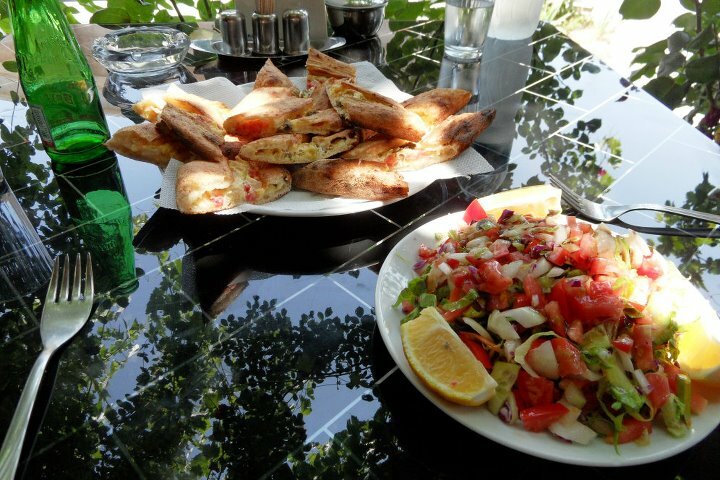 Pide (Turkish wood fired "pizza") with egg, peppers, tomatoes, and local cheese and a "Shephard's Salad" (Chobani Salatsi), Goreme, Turkey, 2011. 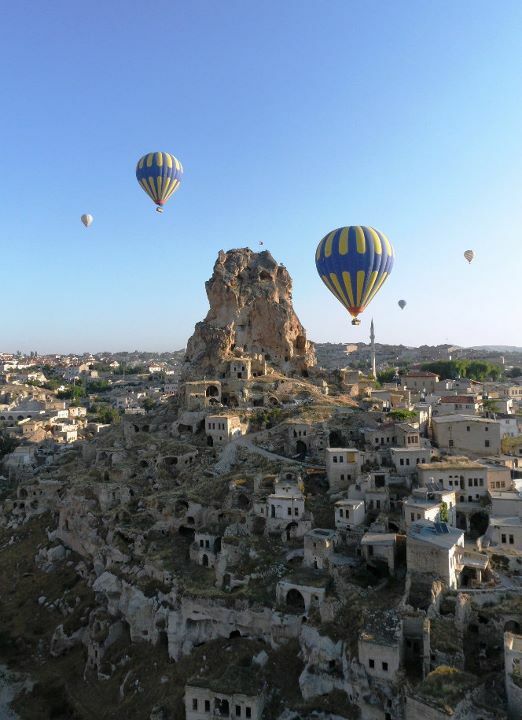 Hot air ballooning, Uchisar, in the Cappadocia region of Turkey. Turkish food is without a doubt some of my favorite food on earth. They are a culture that likes their meat, for sure, but they also adore vegetables, and when we traveled there last summer, there was no end to the awesome salads, bean dishes, and other vegetable dishes. We also lucked out and were there during fruit season, so during hikes in the Cappdocia region, we frequently picked apricot fruits directly from wild trees, and sampled local cherries and many dried fruits with our breakfasts (which usually included bread, farmer’s cheese, olives, and lots of fruit). One of our favorite dishes we came across while traveling was “Menemen”–a peasant dish of eggs scrambled in a rough sauce of onion, garlic, tomatoes, and banana peppers, topped with a bit of feta, and sometimes herbs. It was usually served with lots of fresh bread to mop it all up, and it’s one of those dishes that is hard to mess up, and is thus a good bet whenever you’re relying on a rural village restaurant, a tourist trap when other options aren’t readily available, or a train station-type in-transit restaurant. Every time I had it, it was great. Of course, much of this had to do with the fact that the vegetables available in Turkey were incredible: fragrant tomatoes, herbs from the back yard, homemade cheese, and eggs straight from the chicken…. It’s also interesting as a dish in comparison to American egg dishes, in that the eggs are a component, but not the focus of the dish. There are only 2 eggs in a dish that would serve four people, or two people very generously. We especially enjoyed this dish as a post-hiking meal as we trekked around the Cappadocia area of Turkey, where they often served it directly from the fire in individual, tiny little copper pans (pictures of the stunning landscape there from a hot air balloon ride we took there to the left–need I say more?). Making the tomato sauce for menemen. I couldn’t resist making this a few days ago for lunch, even though the tomatoes available in the grocery stores in Chicago in April are pitiful, flavorless things in comparison with summer Turkey tomatoes. However, it was still delicious, and I look forward to making this in the summer with produce from the farmer’s market. As a side note, down South where I’m from, banana peppers are usually only fried or used for pickling, and so it was inspiring to see them used in so many ways in Turkey in their fresh form. I strongly encourage you to try them out in your Mediterranean dishes! 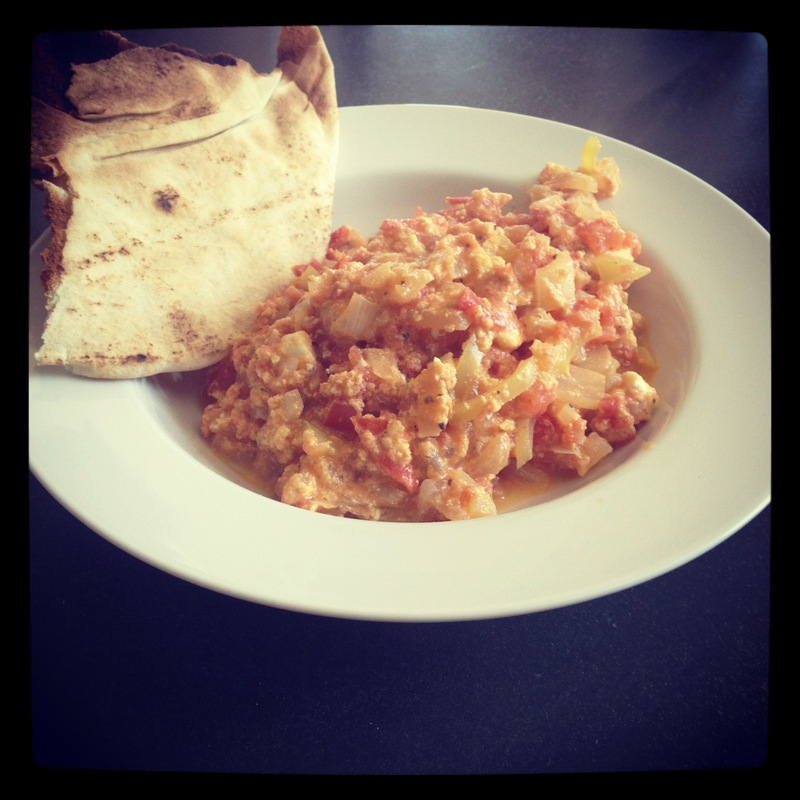 Menemen--it may not look pretty, but it tastes delicious! Heat olive oil in a large, heavy skillet over medium heat. Add the onion and garlic and cook gently until softened, stirring occasionally, for about 4-5 minutes. Add the peppers and cook for another minute. In the meantime, dice the tomatoes finely. 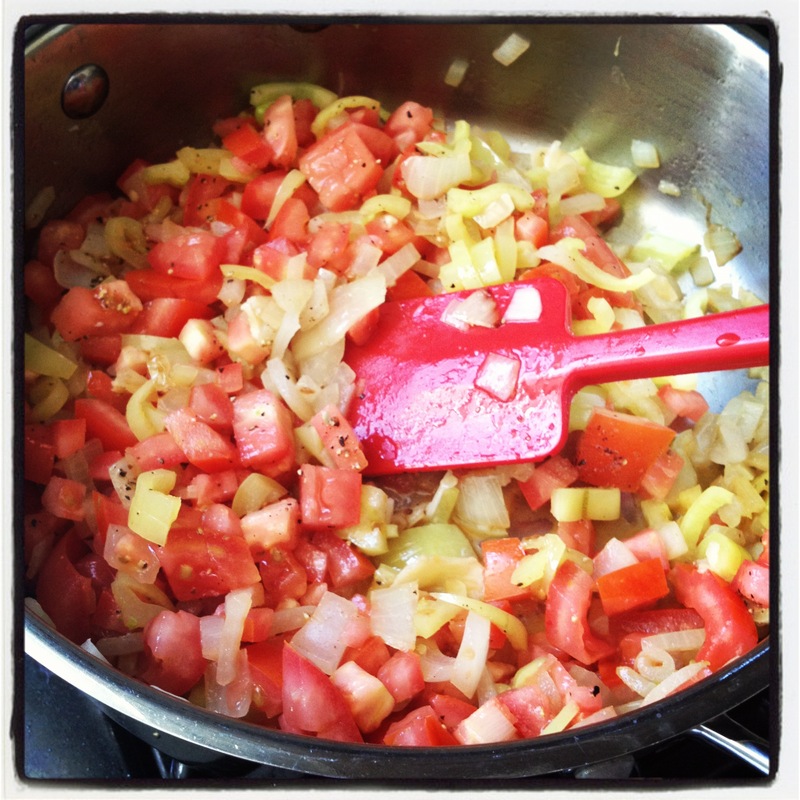 Do not discard the vine; it will add extra tomato flavor to the dish. Add the tomatoes together with the vine and salt. Turn the heat up to medium-high, cover and cook until the sauce begins to thicken, for about 5-8 minutes. Turn off the heat, take the lid off and discard the tomato vine. Crack the eggs into a bowl, whisk them, and then add to the tomato sauce. Stir with a spatula while the heat from the sauce cooks the eggs slowly, for about 2 minutes. Add the crumbled feta cheese, give it another stir, cover and let the cheese soften for a minute. Serve with pita or slices of toasted crusty bread on the side. Sprinkle with chopped parsley right before serving, and serve with harissa at the table so people can make it more spicy at will. Last January, I decided to make 2011 the year of the egg. Even though I happily ate pancakes and other baked goods containing eggs, I had never been enthused to eat them on their own. At diners, I always ordered pancakes or French Toast, looking on with envy as egg-loving dining companions tucked into omelettes stuffed with veggies and cheese and mixed with heaping sides of potatoes and toast. After 27 years, I resolved that I was tired of missing out on the egg party. Plus, it’s a cheap source of protein for this vegetarian. 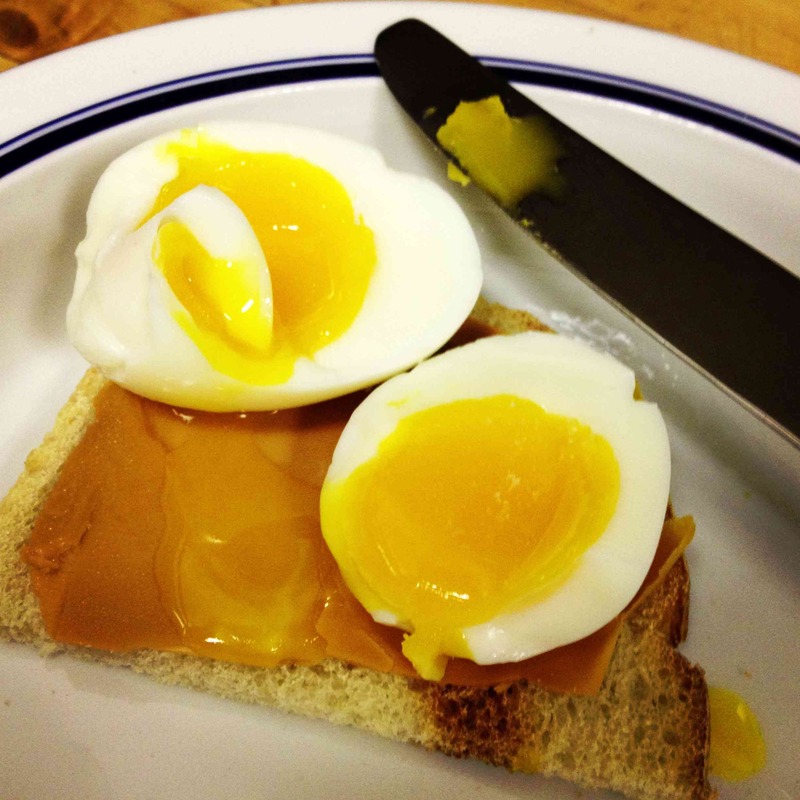 Although now I happily eat most variety of egg (hard-boiled and poached still intimidate me), this method of preparation was one of my first and is still a go-to for a quick and healthy meal that helps clean out the fridge. I got the idea from one of my fave cooking blogs, 101 Cookbooks. Basically, you press a corn-tortilla into an egg as it’s frying- they fuse together in a delightful manner. 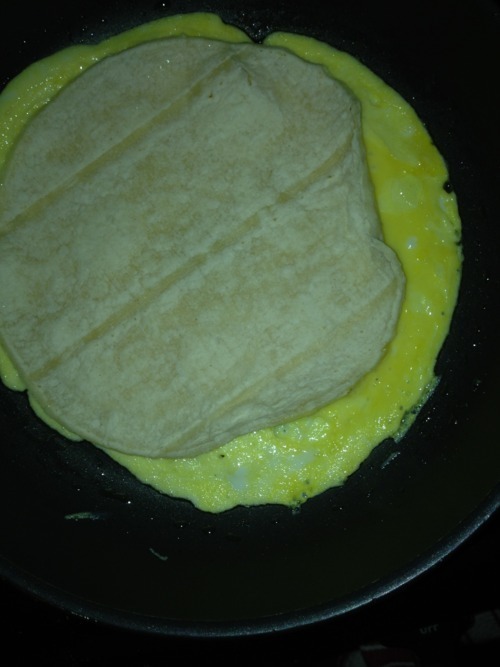 Once the edges of the egg are set, you can flip the whole egg-tortilla combo and fill it with whatever toppings you like. Fry lightly on both sides, and voila, a quesadilla with egg hiding inside, packing a delightful protein punch. I fill this with different combinations- salsa and Cabot cheddar is a good breakfast option (and Cat’s papaya salsa from the previous post would actually be divine in here), but tonight for a quick dinner, I decided to go a different route. I had some peppers left over from a pizza-making venture that were about to go ’round the bend, so I sauteed them and combined with some goat cheese and olive tapenade. Six minutes skillet to plate and I could move on to economics reading. It’s good to be an egg-lover at last. Slice peppers and sautee in olive oil on medium heat for 5 minutes, until soft. Meanwhile, heat some olive oil on medium heat in another skillet. 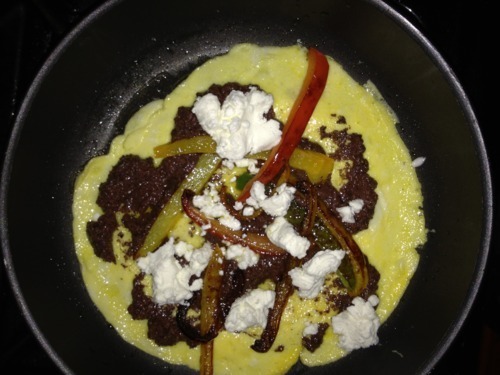 Crack the egg and beat it in a small bowl, then pour into the skillet. Allow the egg to set (about 30-40 seconds). 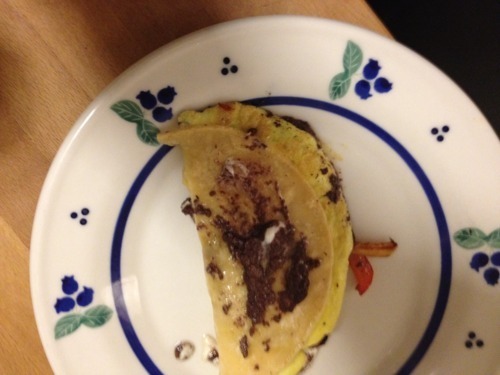 Then, press the corn tortilla down onto the egg. Let rest another minute or so until the edges of the egg seem well-formed. Then flip and add your toppings. Fold in half and fry lightly on both sides (about 30 seconds each side). Then serve.